The languages of Ethiopia refers to the various spoken forms of communication in Ethiopia. It includes the nation's official languages, its national and regional languages, as well as its minority and foreign languages. There are 88 individual languages of Ethiopia according to Ethnologue, with the 1994 Ethiopian census indicating that some 77 tongues were spoken locally. Most of these languages belong to the Afroasiatic family (Semitic and Cushitic languages; Omotic languages are also spoken, though their classification is uncertain). Additionally, Nilo-Saharan languages are spoken by what the government calls the "Nilotic" people, though scholars distinguish Nilotic from the Surmic languages, Gumuz languages, and Koman languages and spoken in Ethiopia. Charles A. Ferguson proposed the Ethiopian language area, characterized by shared grammatical and phonological features in 1976. This sprachbund includes the Afroasiatic languages of Ethiopia, not the Nilo-Saharan languages. In 2000, Mauro Tosco questioned the validity of Ferguson's original proposal. There is still no agreement among scholars on this point, but Tosco has at least weakened Ferguson's original claim. English is the most widely spoken foreign language and is the medium of instruction in secondary schools and universities. Amharic was the language of primary school instruction but has been replaced in many areas by local languages such as Oromo and Tigrinya. After the fall of the Derg in 1991, the 1995 Constitution of Ethiopia granted all ethnic groups the right to develop their languages and to establish first language primary education systems. This is a marked change to the language policies of previous governments in Ethiopia. In terms of writing systems, Ethiopia's principal orthography is the Ge'ez script. Employed as an abugida for several of the country's languages, it first came into usage in the sixth and fifth centuries BC as an abjad to transcribe the Semitic Ge'ez language. Ge'ez now serves as the liturgical language of the Ethiopian and Eritrean Orthodox Tewahedo Churches. Other writing systems have also been used over the years by different Ethiopian communities. These include Arabic script for writing some Ethiopian languages spoken by Muslim populations and Sheikh Bakri Sapalo's script for Oromo. Today, many Cushitic, Omotic, and Nilo-Saharan languages are written in Roman/Latin script. 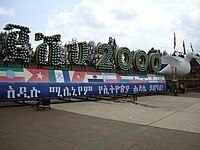 According to the 2007 Ethiopian census, the largest first languages are: Oromo language speakers numbering 24,930,424 or 33.80% of the population; Amharic speakers numbering 21,634,396 or 29.30% of the population; Somali speakers numbering 4,609,274 or 6.25%; Tigrinya 4,324,476 or 5.86%; Sidamo 2,981,471 or 4.84%; Wolaytta 1,627,784 or 2.21%; Gurage speakers numbering 1,481,783 or 2.01%; and Afar speakers numbering 1,281,278 or 1.74%. Arabic, which also belongs to the Afroasiatic family, is likewise spoken in some areas of Ethiopia. Many Muslim Ethiopians are also able to speak Arabic because of their religious background. English is the most widely spoken foreign language which is also taught in many schools. Amharic is the official working language in which all federal laws are published, and it is spoken by millions of Ethiopians as a second language. In most regions it is the primary second language in the school curriculum. In Ethiopia, the term "Nilotic" is often used to refer to Nilo-Saharan languages and their communities. However, in academic linguistics, "Nilotic" is only part of "Nilo-Saharan", a segment of the larger Nilo-Saharan family. ^ "Ethiopian Constitution". Article 5 Ethiopian constitution. APAP. Archived from the original on 4 March 2012. Retrieved 3 December 2011. ^ "Africa :: ETHIOPIA". CIA The World Factbook. ^ (Alula Pankurst|Pankhurst, Alula]]. "Indigenising Islam in Wällo: ajäm, Amharic verse written in Arabic script." Proceedings of the Xlth International Conference of Ethiopian Studies, Addis Ababa 1991. 1994. ^ a b c d e f g "Statistical Tables for the 2007 Population and Housing Census of Ethiopia: Country Level". Central Statistical Agency. 2007. pp. 91–92. Archived from the original on 2012-11-13. Retrieved 2011-08-12. ^ Yigezu, Moges (2012). Language Ideologies and Challenges of Multilingual Education in Ethiopia. African Books Collective. p. 143. ISBN 9994455478. ^ Grimes, Barbara F.: "Languages of the World", 1992. 12th ed., Dallas: Summer Institute of Linguistics, p. 248. ^ "Ethiopia". The World Factbook. Central Intelligence Agency. Appleyard, David. 1998. Language Death: The Case of Qwarenya (Ethiopia). In Endangered Languages in Africa, edited by Matthias Brenzinger. Köln: Rüdiger Köppe. Ferguson, Charles. 1976. The Ethiopian Language Area. Language In Ethiopia, ed. by M. Lionel Bender, J. Donald Bowen, R.L. Cooper, Charles A. Ferguson, pp. 63–76. Oxford: Oxford University Press. Hayward, Richard J. 1998. The Endangered Languages of Ethiopia: What’s at Stake for the Linguist? In Endangered Languages in Africa, edited by Matthias Brenzinger, 17–38. Köln: Rüdiger Köppe. Hudson, Grover. 1999. Linguistic Analysis of the 1994 Ethiopian Census. Northeast African Studies Vol. 6, No. 3 (New Series), pp. 89–108. Hudson, Grover. 2004. Languages of Ethiopia and Languages of the 1994 Ethiopian Census. Aethiopica: International Journal of Ethiopian and Eritrean Studies 7: 160–172. Leslau, Wolf. 1965. An annotated bibliography of the Semitic languages of Ethiopia. The Hague: Mouton. Tosco, Mauro. 2000. Is There an ‘Ethiopian Language Area’? Anthropological Linguistics 42,3: 329–365. Zelealem Leyew. 1998a. An Ethiopian Language on the Verge of Extinction. International Journal of the Sociology of Language 134: 69–84. Zelealem Leyew. 1998b. Some Structural Signs of Obsolescence in K’emant. In Endangered Languages in Africa. Edited by Matthias Brenzinger. Köln: Rüdiger Köppe. Zelealem Leyew. 2004. The fate of endangered languages in Ethiopia. On the margins of nations : endangered languages and linguistic rights. proceedings of the eighth FEL Conference, Eds. Joan A. Argenter & Robert McKenna Brown, 35–45. Bath: Foundation for Endangered Languages.